Below the surfmap there are surf break descriptions and locations of each break. The most consistent beach in the country. Playa Hermosa lies 5 minutes south of Jacó. There are great beach breaks at low and high tides. When weather conditions are nice, you may see some amazing tubular waves rolling in. This is one of, if not the best break in the country. This is the ideal town for surfers. It is located at a strategic site from where to reach other spots. Jacó has great beach breaks. It offers a great variety of lodging facilities, as well as restaurants and great party town with many bars open all night. Access to this beach is private. It can only be reached by boat from Playa Herradura. It has constant left and right breaking waves. Best spot for surfers when weather conditions are stable. Beware of low tides! Entrance to this beach is from the Costanera Highway, to the south of Caldera. This beach offers right and left breaking with strong currents. At the mouth of the river you can find an almost perfect, sometimes tubular, left wave. Not many options for lodging, but you can camp right on the beach, and there are a couple of good restaurants where you can eat. Despite its many attractions, the water in Tivives is quite polluted and the ocean is dangerous. South of Tivives, this rocky headland offers much action. You will have to paddle your way across the river, and then walk through the trails. Just like Tivives, this site has many great spots for surfing. Water is also polluted and the ocean is just as dangerous. Twenty-five minutes north from Jacó is Puerto Caldera, a very popular beach with a well-shaped left breaking wave. The surfing gets better when the tide is coming in. The most traditional wave of Costa Rica is to be found at this beach: well-shaped left breaking wave, and some waves range from 3 to 10 feet, when good waves hit shore from the south. The best surfing time is 5:00 am. You will find many nice places where to spend the night in the area close to the point. This rock lies 5 minutes south of Jacó; to get there you must climb down a deep cliff and walk across a rocky strait. Waves are real good and heights range between 4 and 10 feet. There are just as many left waves as right waves. Be careful, this is a dangerous place! This beach is 40 minutes south of Jacó. It has great local food restaurants, great beach break spots, and few surfers. It takes one hour and a half to drive from Jacó to Boca Damas. This beach sits next to the mouth of Damas river, near Quepos. It offers big waves. We recommend you go surfing with other people, specially someone who knows the area. This beach sits some three and a half hours from San José (two and a half hours from Jacó). It offers great hotels and restaurants, and it holds some of the best beach breaks of Costa Rica. One of its waves ranges from 3 to 8 feet high. Waves here break mostly towards the left. You will need strong waves for great performance. This beach faces the town of Quepos. There are many restaurants and hotels in the area. This is a very popular and busy place, so you will have a chance to enjoy an overwhelming nightlife. This beach has waves breaking towards the right and left. Wait for strong waves to roll in, otherwise the beach is too small for good surfing. 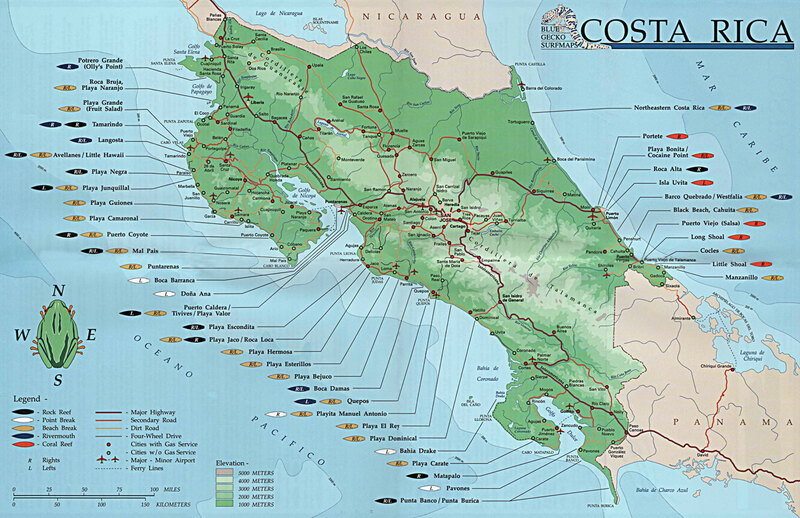 We also recommend an expedition into the Manuel Antonio National Park. This beach offers left and right breaking waves, similar to Playa Hermosa. There are no lodging places, but it is great for camping and surfing. You will have to ask among locals in Quepos how to get there, since the entrance to this beach is inside a palm tree plantation. If you are lucky, you will be able to do some surfing while watching near-by dolphins playing around, which proves to be an amazing experience to everyone. There are many restaurants and lodging spots. Here you can surf on left as well as right breaking waves; the bottom of the sea is covered by rocks.